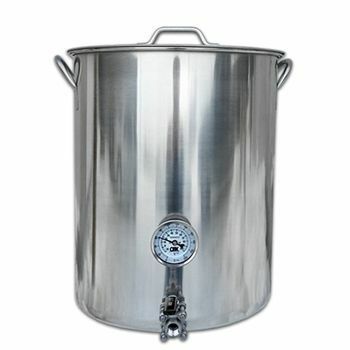 10 Gallon Heavy Duty Stainless Steel "Mash King" Brew Kettle with Ball Valve and Thermometer Included. 10 Gallon Tall Kettle Approximate Dimensions: 13.3" Wide x 16" Tall. A quality brew kettle made from polished stainless steel. 16 (US) gallons (60L, 64 Quart) total volume with graduated volume markers from 1 to 14 gallons. A taller height to width ratio improves the boil, which leads to better beer. This brew kettle features weldless connections and includes a stainless steel three piece ball valve, in addition to a 2" probe thermometer. Includes lid. Two welded 1/2" coupler brew kettle made from polished stainless steel. 16 (US) gallons (60L, 64 Quart) total volume with graduated volume markers from 1 to 14 gallons. A taller height to width ratio improves the boil, which leads to better beer. This brew kettle features weldless connections and includes a stainless steel three piece ball valve, in addition to a 2" probe thermometer. Includes lid. Includes Stainless Steel 3 Piece Ball Valve with the welded kettle kit. Our extremely popular Stainless Steel 20 Gauge Brew Pot is a great entry level brew pot that comes with a Stainless Steel 3 Piece Ball Valve & 2" Probe Thermometer included. Capacity of 19 gallons (71.9 liters). Two port kettle with 1/2" female couplings aligned vertically. Boiling the wort is an important process in brewing. This process takes place before yeast is added to encourage fermentation of sugar. It is done to release the flavour of the hops, sanitize the wort and encourage the necessary chemical reactions. The wort is often brewed in large vats but homebrewers can always use stainless steel brew pots/kettles. 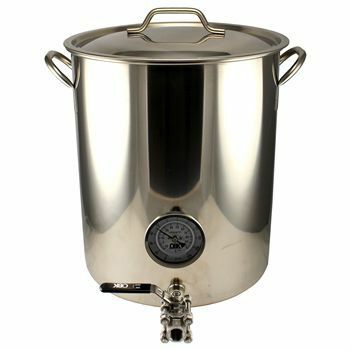 Neophyte brewers can benefit from a stainless steel brew pot, they are convenient because they are easy to clean. During the process of boiling the wort, there is a tendency that the liquid will caramelize at the bottom. Using a stainless steel brew pot prevents this particular problem from happening. 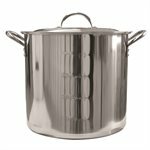 This particular brew pot is made from 200 Series 20-gauge stainless steel which has adequate resistance against corrosion. It is a great material for entry-level brewing pots. The pot has the capacity to hold 19 gallon of wort for adequate brewing. This is a good size for home brewers who are still starting out. This stainless steel brew pot also comes with a stainless steel ball valve and probe thermometer which can be fastened to the pot using the two female couplings. The pot's surface is polished to give it a sophisticated look. Since the pot is made from stainless steel, it is safe to use oxygenated cleaners to clean it without worrying of any unnecessary chemical reactions that will damage the pot's surface. An affordable price on a stainless steel kettle. Good for boiling up to 3 gallons of wort. Comes with handles and a stainless steel lid. 10" H x 12.5" D. Kettle has heavy duty 1.2mm thick sides and bottom. 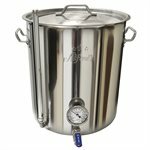 8 Gallon welded couplers with graduated markings Brew Kettle - Two welded 1/2" coupler brew kettle made from polished stainless steel.8(US) gallons (30L, 32 Quart) total volume with graduated volume markings from 1 to 7 gallons. A taller height to width ratio improves the boil, which leads to better beer. 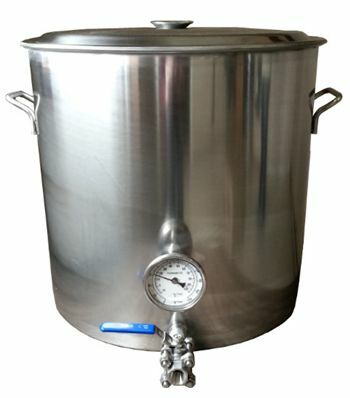 This brew kettle features welded port connections and includes a stainless steel three piece ball valve, in addition to a 2" probe thermometer (with the option to upgrade). Includes lid. Includes Stainless Steel 3 Piece Ball Valve & 2" Probe Thermometer. This is our new line of weldless brew pots. 20 gauge, 8 gallon (32 quart) stainless steel kettle. 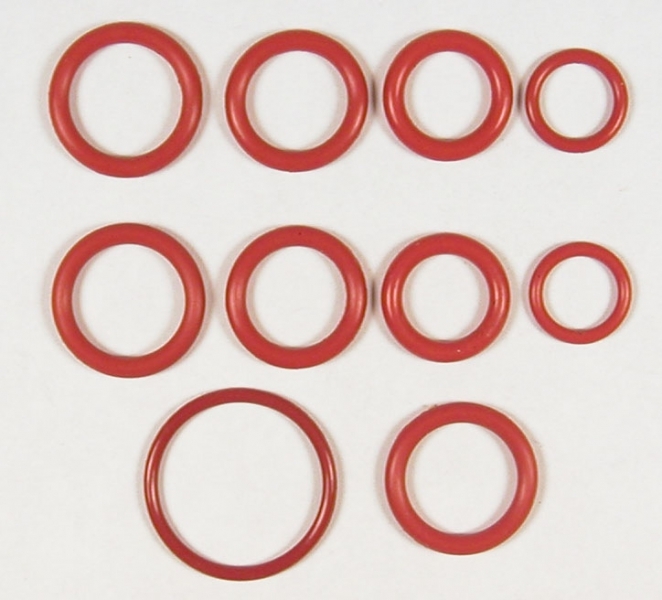 • 1.25" from center of bottom port to the bottom of the pot. • Inside height: 13 5/8"
• Inner Diameter: 13 5/8"
8 Gallon Heavy Duty Stainless Steel "Tall" Brew Kettle with Ball Valve and Thermometer Included.